If you have kids and haven’t read one of Mo Willem’s books, you’re in for a treat! Mo Willem’s is one of my all-time favorite authors. He’s writes books that appeal to young readers and captivates even the most reluctant readers with his relatable and hilarious characters. Plus, his illustrations are engaging and hook readers, as they are able to easily follow the story based on the pictures. I’ve been reading Mo Willem’s since my days in the classroom and it’s even more fun now reading them with my own children. This week, I’ve partnered with YOTTOY Productions, Inc.for a super amazing giveaway of the soft pigeon and a copy of Don’t Let the Pigeon Drive the Bus on my Instagaram feed. So, in celebration of Mo Willem’s, and my exciting giveaway here’s a list of my top 10 Mo Willem’s books ( in no particular order)! 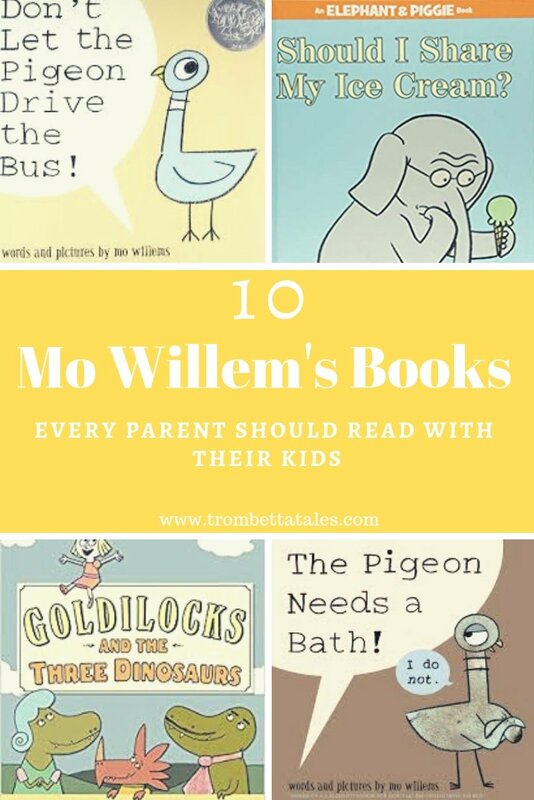 Celebrating it’s 16th anniversary, Mo Willem’s first book in the pigeon series relates perfectly to children. They will laugh out loud to the pigeons demands to drive a bus, as he models a typical toddler tantrum. Do you a child that is reluctant to take a bath? This hilarious book where pigeon finds every excuse in the book to not take a bath. Readers will squeal with delight about the series coaxing it will take to get pigeon into the bath tub. When a ducking arrives on the scene and asks for a cookie politely, he gets one! Pigeon goes off on a hilarious rant about things he’s asked for, but hasn’t received, even when he’s asked politely. Eventually, the ducking gives pigeon his cookie, but goes off asking for another cookie with nuts. In true Mo Willem’s fashion, he does a wonderful job of using humor to teach about the importance of politeness and sharing. In typical Pigeon fashion, he pleads to have a puppy, but in the end decides he wants a walrus instead. A super relate book for children pleading with their parents to have a pet, as it teaches the power of persuasion and the daily hard work a pet requires. Perfect for the pre-school aged crowd who are learning about navigating friendships during playtime. It has a wonderful message about the power of inclusion and accepting friends that might be different. Waiting is another HARD concept for preschoolers and this book nails it! It addresses the topic of waiting in a relatable manner teaches children that lesson of “good things come to those who wait”. This is the final book in the Elephant and Piggie series! But, in true Mo Willem’s fashion he sneakily uses this book as an opportunity for Gerald and Elephant to give thanks and say goodbye to all of their readers and friends. It’s also a perfect book to spark a discussion about the importance of saying thank you and for having gratitude in everyday life. Gerald has a touch decision- should he share his ice-cream come with his best friend Piggie? Another book in this delightful series that brilliantly shows the dilemma inside a “toddler brain” when asked to share something special. It’s definitely a book that will spark discussions about sharing and friendship! On a trip to the Laundromat with daddy, Trixie loses her beloved lovey, which sparks a set of toddler emotions and a frantic father. 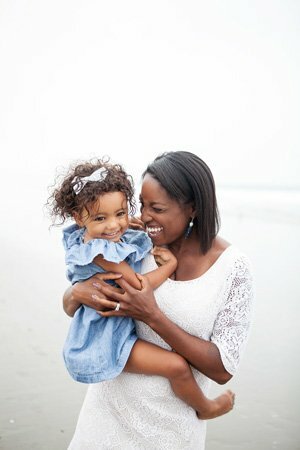 Parents and children will relate to the intense emotions of losing a beloved object, even if for only a short period of time. The black and white city illustrations also give this story an extra special touch. Also, don’t miss other books in this lovable series: Knuffle Bunny Too: A Case of Mistaken Identity and Knuffle Bunny Free: An Unexpected Diversion. A new approach on Goldilocks and the Three Bears in this hilarious fractured fairy tale of three hungry Dinosaurs: Papa Dinosaur, Mama Dinosaur and and a Dinosaur (a little girl) visiting from Norway. It’s a story that parents will want to read to with their children over and over again! 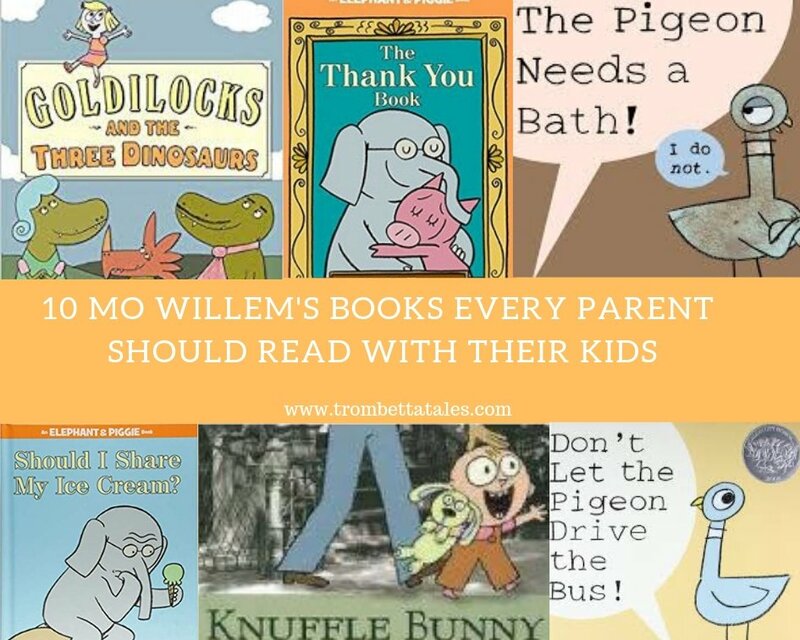 Tell me some of your favorite Mo Willem’s books in the comments! I always love hearing your book recommendations. Also, don’t forget to follow along on our Instagram reading journey and to pin the image below! Next Post Will Your Child Actually Benefit from Reading with Stuffed Animals?